Aug. 14. It looks like a buoyant economy—consumer confidence in June rose higher than expected—helped put a Lake Norman job resources group out of work. The board of Helping Others Help Themselves (HOHT) has decided there is no longer a need to continue operations. “The economy is back on its feet and we’ve run out of people to help,” said co-founder Joe Carbon, who launched HOHT seven years ago with Vickie Stevens, another active Lake Norman Chamber volunteer. Over the course of seven years, though, much has changed. In addition to rising consumer confidence, job growth is strong, with more than 209,000 jobs coming on in July, according to the Bureau of Labor Statistics. At 4.3 percent, the jobless rate is approaching full employment. About 200,000 new jobs a month is considered a sign of a robust economy. In April of 2010, the US jobless rate was almost 10 percent. HOHT had support across North Meck, with an assist from the Lake Norman Chamber where both Carbon and Stevens are ambassadors. Created a website and a “job bank” where employers could post jobs and job seekers post resumes and then managed them in order to help employers and job seekers connect. Monthly workshops to educate and improve job seeker skills with a strong focus on networking. 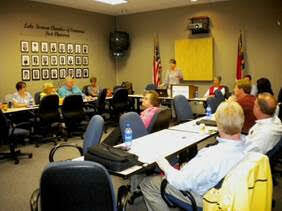 Encouraged job seekers to attend Lake Norman Chamber events as well as other business groups. Pointing to an improving local economy and job market, the folks at H.O.H.T. (Helping Others Help Themselves) have decided to wrap up more than seven years of operations of their Lake Norman-area job bank, monthly job seeker workshops and networking events. Please read story to the right of this column.